Are you serving up canned or live content at your Olympics? While talking to Judy Kucharuk on the weekly #eventprofs happy hour hangout this week, she mentioned that she was watching the Olympic opening ceremonies live in her home in British Columbia. Our U.S. chatters were having no such luck. NBC made it hard to watch the Olympics online in the U.S.—you have to subscribe to cable-huh?-and have MSNBC and CNBC—and refused to show the opening ceremonies live, deciding to delay broadcast until “prime time” (whatever that means these days). Doing stuff like this annoys lots of people. Indeed, many technologically savvy US citizens simply found live Olympic web streams in other countries. 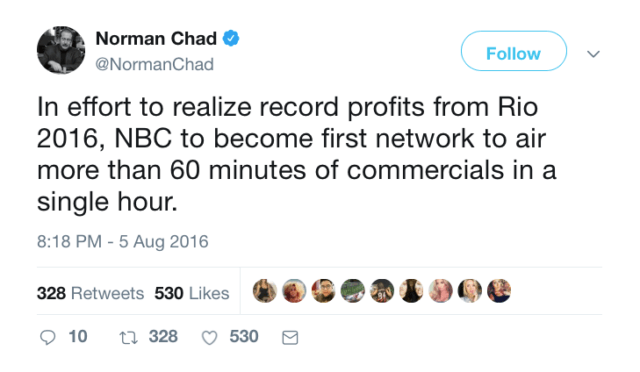 Or they watched other country’s live coverage on their Roku boxes. Net result – loss of eyeballs on NBC. NBC isn’t doing what its viewers want. It’s doing what it wants, to satisfy its legacy business model. A model that is becoming more and more out of touch with what consumers—who supply the eyeballs for advertisers—want. When NBC broadcast the 2000 Olympic games, online internet streaming didn’t exist. The company had a U.S. monopoly on placing its expensive cameras around the Olympic venues. Today, every spectator can bring an inexpensive decent quality videocam, stream what they can see, and tweet commentary. (A special law was passed to make this a criminal offense; yeah, with hundreds of thousands of spectators, that’s gonna work really well.) Twelve years ago, NBC could decide how to package its coverage and get away with it because there was no alternative. Today, using the same model leads to widespread complaints and increasing defection from their content. When spectators at an Olympic event can provide better live coverage than a $30 billion company, that company had better watch out. What’s happening at your Olympics? Today, the old model of providing canned content at a conference has become archaic. People no longer want to be passive spectators; they want live opportunities to connect with and be part of what’s going on. There are plenty of alternatives for broadcast content now; they don’t need to attend a face-to-face event any more to access this style of content whenever and wherever they want it. When your conference competition can provide a real time, interactive, and relevant conference experience to attendees, a large majority will choose them over a traditional, broadcast-heavy event, no matter how slick the production values. If you’re still serving up the latter, you’d better watch out. This entry was posted on Monday, July 30th, 2012 at 8:10 am	and is filed under Event design. You can follow any responses to this entry through the RSS 2.0 feed.You can leave a response, or trackback from your own site. I have only just discovered your work but it is amazing.